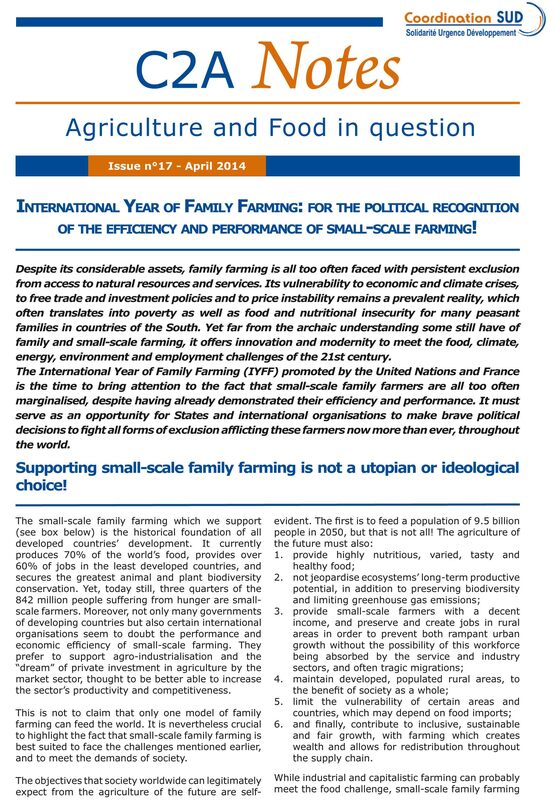 InternatIonal year of famIly farmIng: for the polItIcal recognItIon of the effIcIency and performance of small-scale farmIng! Despite its considerable assets, family farming is all too often faced with persistent exclusion from access to natural resources and services. Its vulnerability to economic and climate crises, to free trade and investment policies and to price instability remains a prevalent reality, which often translates into poverty as well as food and nutritional insecurity for many peasant families in countries of the South. Yet far from the archaic understanding some still have of family and small-scale farming, it offers innovation and modernity to meet the food, climate, energy, environment and employment challenges of the 21st century. The International Year of Family Farming (IYFF) promoted by the United Nations and France is the time to bring attention to the fact that small-scale family farmers are all too often marginalised, despite having already demonstrated their efficiency and performance. It must serve as an opportunity for States and international organisations to make brave political decisions to fight all forms of exclusion afflicting these farmers now more than ever, throughout the world. This paper was written by AVSF, member of the Agriculture and Food Commission (C2A) of "Coordination Sud" which brings together international solidarity NGOs working to realize the right to food and increase support for smallholder farming in policies that impact world food security.